You are cordially invited to the Annual RBS Picnic and Auction, Sunday, May 20, 2-5 p.m. This event will take place at the Carillon Shelter at Byrd Park in Richmond. This event is a great way to socialize with the club members and find bonsai plants, pots, tools, and other supplies for a great price. RBS will supply the main dish (BBQ Sandwiches), ice, drinks, paper goods, and utensils. Members should bring a side dish or dessert to share. Auction items should arrive from 2-3 pm, we’ll eat at 3 pm, and the auction will begin about 3:30. You must be a current RBS or PBA member to sell or bid on items at the auction (but you can join that day). A minimum 20% from each sale is donated automatically to the club, but you keep the rest of the sales. Typically, members bring 3-5 items each to sell. If you have more than that, consider grouping them into lots. Also, please limit items to bonsai related plants, tools, pots, books, etc… Members with items to sell must arrive early (2 pm) to fill out the required form. In addition, we will be electing officers for the 2018-2020 term. Anyone interested in running should contact Ron or Randi. Also, this event will serve as our regular meeting for the month of May. There will be no meeting on May 28. 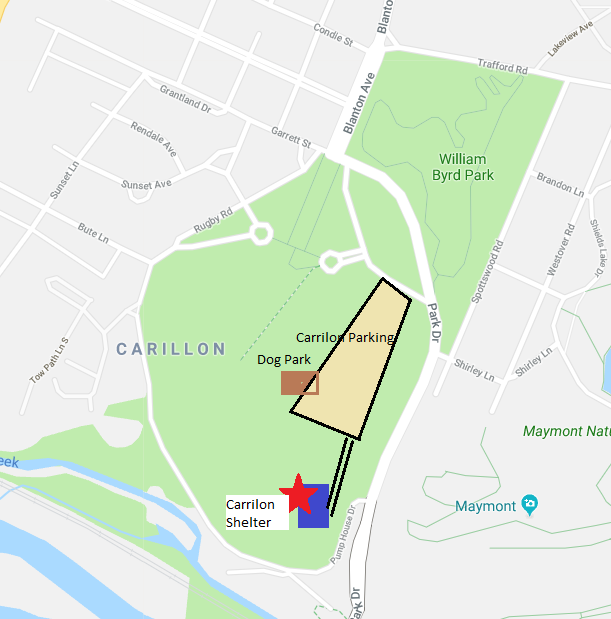 The Carillon Shelter is near Barker Field and the Toll Booth. The closest searchable address is for the Carillon, (1300 Blanton Ave, Richmond, VA 23221) which is nearby. There is another shelter closer to Maymont’s Nature Center, so do not get them confused. Watch for “RBS” signs marking the path to teh shelter.